Do You Have Thumbtacks in Your Relationship? Thumbtacks. It’s a metaphor about total acceptance that works so well that we used it in both our books, and we’ve found that it resonates well with others, too. Picture yourself barefoot, leaping and prancing around on a dance floor. You feel totally free to be completely yourself. You can express yourself however you want. Now imagine one thumbtack being introduced. (Drawing pins to our English readers!) You don’t know where it is on the floor or when you will encounter it. You can no longer let the muse of dance take wing. You never know when you will come down upon that one thumbtack; every step is a risk. 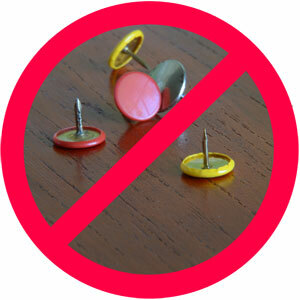 Thumbtacks represent, of course, lack of total acceptance from your partner. They’re criticisms, irritations, demands; they all want you to act differently in some way. Your partner doesn’t accept you as you are. But when there are no thumbtacks, when your partner offers what we call 100% acceptance, the effect is transforming. You can be yourself. The importance of 100% cannot be underestimated; it is nothing like 99% because anything less involves measurement, division, in and out, good and bad. It enables total freedom from the need to withdraw and to defend, and consequently to separate. The extraordinary freedom to be yourself that comes from this kind of acceptance can only be achieved by 100%. The freedom is liberating. Just as with the dancing, there is no comparison; 99% acceptance and 100% acceptance are not different by 1%. They differ in quality in the way that two parallel lines differ from two non-parallel lines. Do You Have Thumbtacks in Your Relationship? #relationships #marriage #relationshipadvice Click To TweetIf there is some small corner within your partner that is still holding back acceptance, you never know when it might rear its head and bite you, so you must still always be guarded to some degree or another. The more thumbtacks you encounter, the less open and sharing you will become. But when each partner is assured of complete acceptance, it is transforming and wonderfully liberating; by being completely ourselves, we are that much more real, authentic and trustworthy to the other. Once you reach the threshold of 100%, your mind is not busy with whether the person is right or wrong, or needs changing or adjusting. Instead, when you accept yourself and the other and go forward in the freedom that this way of being brings, it creates an exquisite experience of peace and joy. This is not to say that people should tolerate anything and everything, acting like a doormat and letting their partner walk all over them. Instead, it is only possible in a partnership that has core agreements in place. They vary from couple to couple, but examples would be trust, honesty, fidelity and fiscal approach. When your values are in agreement, nothing else is necessary. You can give your partner the space to do and be anything. Lack of projections and demands is critical to being in this place together. Many people have their heads filled with everything they think they need to make things work, in any situation and in every relationship. They have so many things decided in advance – what they need in common and how things have to look and feel – that there is very little room for anything to actually just be, let alone the coming into being of something new. When you have shared meanings and values as your basis for agreement and union, then you can let go of determining the specifics. You can enjoy the experience of another person, one who is totally unique, and celebrate the difference. You can be constantly enriched by the other. You will be able to reside in the present, experiencing what is, without preconceptions. Of course, to do this, you have to accept what is offered. After a lifetime of thumbtacks, being yourself in a relationship may be unfamiliar. For years, Phil would deflect compliments with “No, I made it too salty,” or “Oh, it’s only a thrift-store hat.” Now, he usually manages to just say, “Thank you.” It can be hard for many people to own themselves. The other side of this is that you must offer your partner the same; you must accept them totally, and that is where the work is. They’re different. They do things differently and think differently, and so what? It’s none of your beeswax. If you don’t try to fit the other into an idea or a mold or a picture of what should or could be, you can experience what is. Remember that words have power and can be as sharp as tacks. Learn to listen to yourself and what words you use to your partner and what tone of voice you say them in. This is not a process. It is a transformation. You either move into 100% or you don’t. The effect of this complete openness cannot be emphasized enough. It produces a quantitative change in the experience. We have found that with this underpinning our relationship, there is no limit to the peace, love and joy that we can experience together. This openness feeds on itself, creating an ever-increasing bond and intimacy. It fills us with strength and security to go about our daily challenges. To those of you who have been in a relationship for a longer period of time which does not embody total acceptance, it is always possible to change this, and it can be done surprisingly rapidly. This is because it is a transformation, not really a process. If both of you really want to find this other way of being together (and you would be surprised how many couples both really want this), you can actually make a sharp turn and begin afresh without the thumbtacks! You can do this by communicating with each other honestly, intimately, and without accusations or attacks. Have a look at Our Process, the way we handle differences without conflict, and adapt it to fit your situation. We wish each and every one of you this basis for your togetherness. May you be filled with joy and learn to celebrate each other! Thumbtacks input was exceptionally timely this morning. I have forwarded this on to some dear friends. I’ve talked to them about your book and ideas. One of them has read it. They both know their marriage is not well and may not stay intact (no metaphor intended. I have forwarded today’s post to them. I hold them in my heart and prayers. Thank you so much for your blogs, ideas and love. Oooh, such a good and useful image! Thumbtacks is exactly what creates those little (and not so little) misunderstandings. Thanks SK! This image does seem to resonate and be useful. We appreciate your feedback.